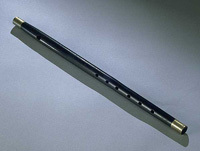 The fife, like the one in the photograph, was made from wood. It was the custom for flute players to steep these older wooden flutes in water to give the instrument a more mellow tone. Flutes were very common because they were cheaper than most other instruments.